Oh dear! So, Marty has not had a great week. In fact, he’s had a very weird week. After Saturday’s escapade, I thought we’d maybe turned a corner and were finally figuring out how to get along. As always, it was Marty’s duty to prove me wrong and keep me thinking. He had Sunday off – perhaps that was my mistake? – and on Monday afternoon everyone was due to have their feet done. Marty did not want to be caught and pulled away as I was doing up his halter, which was mildly disappointing, but I shrugged it off and caught Cash instead. I left Cash on the yard, went back to the field, and was rebuked by Marty once again – so I caught Iris, and took her away, too. By this point Marty was beginning to think that not being caught wasn’t as great an option as he’d thought, and so when I returned he grudgingly allowed himself to be haltered. He did have to do a very funny thing of cantering past me, his head turned in my direction, his ears pricked up and his nose in the air before we could do this, however. I guess he had opinions to share. When I returned him to the field later, he was good as gold about having his halter removed. On Monday, after trimming, and before he remembered that he hates me. On Tuesday morning I arrived at the field first thing to take Cash out. The herd came to greet me, as usual, and I offered Marty my hand to touch, as usual. He sniffed it with flared nostrils, his eyes wild, and then literally trembled his way backwards. This struck me as a little bit weird, but as I wasn’t there to catch him I just got on with what I had planned. It occurred to me, while I was out with Cash, that maybe I should make a point of talking to and catching Marty because of his earlier reaction; but I had to get to work, and I wasn’t keen to embark on a prolonged catching session. 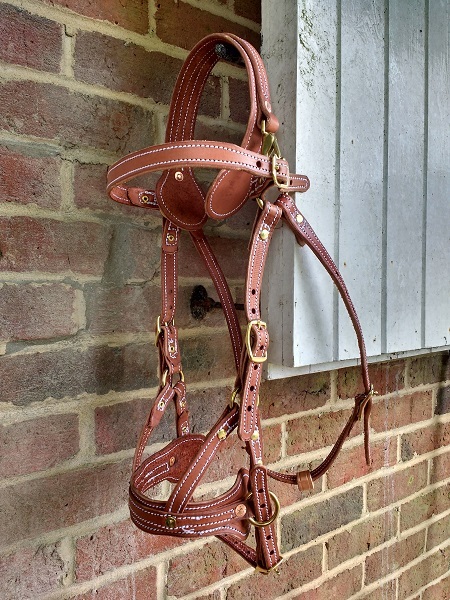 At lunchtime the postman delivered the sidepull bridle I’d had custom made by the Zinkel Long Ears and Pack company. It’s so beautiful! It has a buckle on the browband, as well as the snap-on crownpiece, so it should be acceptable to a mule who’s extremely precious about his ears. I was really excited to try it on him, and after work I went straight to the yard and picked up his halter. I tried for 20 minutes to catch him, but he was in a furious mood and kept chasing the horses and charging around with his ears back. He wasn’t the least bit interested in checking in with me. I could feel myself getting annoyed, so I decided to take a break and make things easier for myself by setting up a pen in the corner. I haven’t had to use a mule pen for a few months now, but as it worked so well before I figured I could introduce it again. I directed him in there easily enough, but he was still adamantly clinging to freedom and I quickly realised I was just too frustrated to work with him. He is a very sensitive guy and he certainly wasn’t going to come near me while I was cross with him, let alone allow me to halter him. An hour after I’d first entered the field, I gave up and left him in the pen for the night (with food and water, obviously. I’m not completely evil, only a little bit evil). On Wednesday, he had a follow-up appointment with Gavin Scofield at 9am. The problem with this was that we were forecast heavy rain from 8am onwards, and of course Marty won’t wear a rug. I was at the yard by 7am. 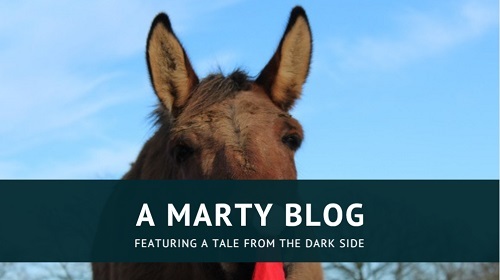 Plan A was to catch Marty and leave him and Iris in their stables; Plan B was to give up on the mule entirely, and ask Gavin to look at good, easy, wonderful, sweet-as-they-come, almost-always-catchable Cash pony instead. I was actually able to catch Marty, although he was extremely nervous and twitchy. When I led him into the horses’ paddock and haltered Iris, he lost it entirely and tried to run out backwards. His reaction was very specifically centered on when I opened the halter out, ready to put it on Iris, rather than the action of simply picking the halter up. Marty, considering his life choices. With mare and mule inside with a haynet each, I went to work and was pleased to find that Marty was still in his stable when I came back later. It’s the little things! He was very good for his appointment and Gavin was able to get a lot done. It’s funny, because Marty really isn’t keen on most men, but he thinks Gavin is wonderful. It probably has something to do with Gavin telling him that he’s splendid all the time. 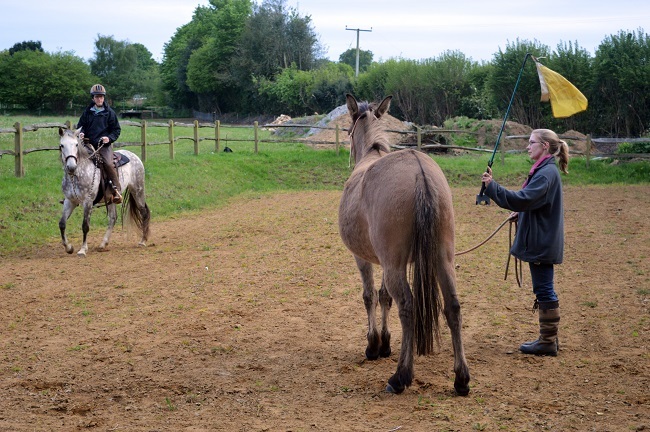 It began to rain just as the session finished, and Marty very neatly and politely sidestepped under the stable roof to keep dry. He then pulled some very mean faces at Gavin, who’d tried to pet him. Gavin just laughed and said that Marty knew the appointment was over, and was dismissing him! I like Gavin a lot, too. He understands mules. I put Marty back in his pen and then spent 10 minutes trying to persuade him to just stand nicely instead of thrashing around every time I touched the halter (like, please stop throwing yourself around, mule. You’ve just had work done to help with that tension in your neck. Don’t undo it by giving yourself whiplash). The rest of our week was fairly standard. He had Thursday off, and was caught Friday and Saturday and worked a little in the field and arena. He was easily distracted and we had to go over basic things quite a bit, but overall he did well. Both times I was able to catch him (although he was very tense), and both times he was very difficult to unhalter. Marty was more concerned by the flag on the floor than the flag in the air. Iris was just looking for excuses. Thank you to Debbie for the photo! He has remained in his pen since Tuesday. I would like to point out that I do not feel good about this, as I do not believe in keeping equines in a way which does not allow them to interact and play with each other. I have done it before, briefly, as it seems to be the recommended way among the American mule folk when dealing with a difficult mule; but I could never bring myself to keep him in there for more than a couple of days. 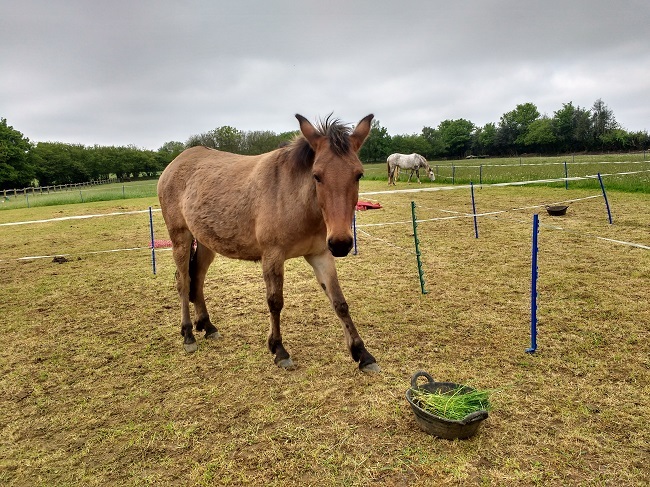 This time, however, he’s also in there to keep him off the grass as the landowner had the fields fertilised this year – for the first time in a while – and I think it’s sent him a bit silly. The horses are silly, too, but they haven’t quite reached mule standard. 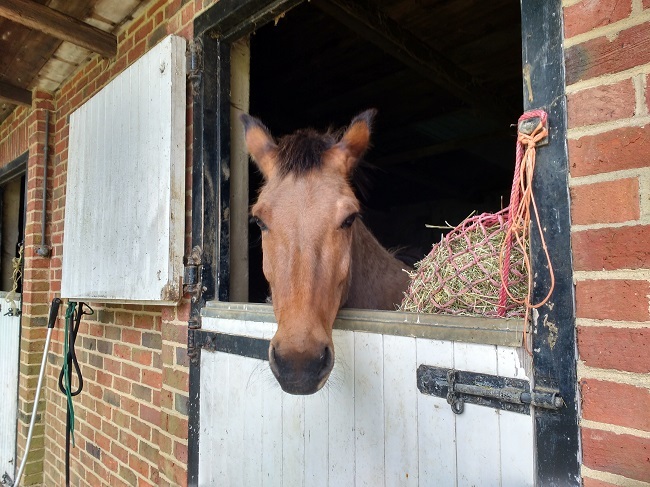 On Sunday, I was out all day visiting Sarah Weston and her mule, Henrietta (an entirely separate entry about that to come – although Sarah’s post about the 2016 Hen Party is here!). Marty had been slowly thawing out all week, and by Sunday evening he was just delightful. I didn’t try to catch him, but hung out in his pen and introduced him to some new toys. He was mellow, inquisitive, and willing to interact. 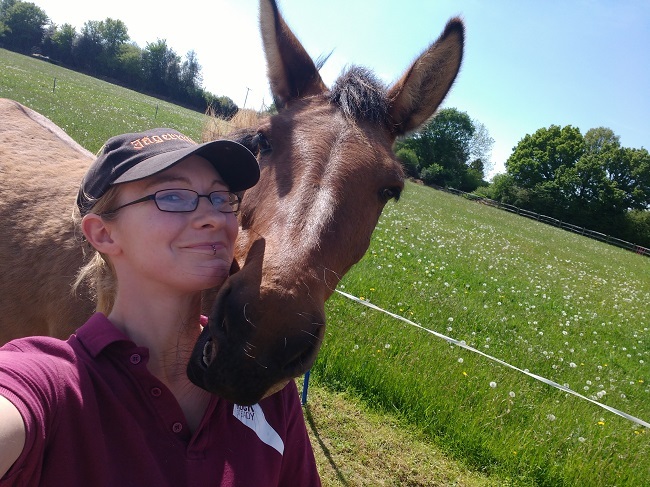 On Monday morning, as I naively rocked up at the yard with my heart still full from how lovely he’d been no less than 12 hours earlier, it was to be greeted with a mule who flatly ignored my arrival, flinched when I entered the paddock, and then flinched every time I moved (I didn’t approach him, but I had water buckets to fill, haynets to change, and poo to pick up). He couldn’t look at me, either, although he kept his ears on me the whole time (you know, just in case I was about to shoot him with lasers or turn into a werewolf). I can only assume that this change in behaviour is due to the fact that a person on Instagram had asked if he was pregnant, and then when I replied in the negative, they described him as “bulky”. Marty had his feelings hurt and is mad with me for uploading the photo in the first place.